What is the AIDA Model in Marketing? The AIDA Model, which stands for Attention, Interest, Desire, and Action model, is an advertising effect model that identifies the stages that an individual goes during the process of purchasing a productCost of Goods Sold (COGS)Cost of Goods Sold (COGS) measures the “direct cost” incurred in the production of any goods or services. It includes material cost, direct labor cost, and direct factory overheads, and is directly proportional to revenue. As revenue increases, more resources are required to produce the goods or service. COGS is often or serviceJob Order Costing GuideJob Order Costing is used to allocate costs based on a specific job order. This guide will provide the job order costing formula and how to calculate it. As an example, law firms or accounting firms would use job order costing because every client is different and unique. Process-costing, on the other hand can be used. The AIDA model is commonly used in digital marketing, sales strategiesKnocking on DoorKnocking on Door is a lead generation strategy used by investment banking advisors looking to secure prospects for business while keeping expenses at a minimum. The strategy started in the early 20th century when insurance agents would go knocking on people’s doors., and public relations campaigns. Attention: The first step in marketing or advertising is to consider how to attract the attention of consumers. Interest: Once the consumer is aware that the product or service exists, the business must work on increasing the potential customer’s interest level. For example, Disney boosts interest in upcoming tours by announcing stars who will be performing on the tours. For example, if the Disney stars for the upcoming tour communicate to the target audience about how great the show is going to be, the audience is more likely to want to go. Action: The ultimate goal is to drive the receiver of the marketing campaign to initiate action and purchase the product or service. 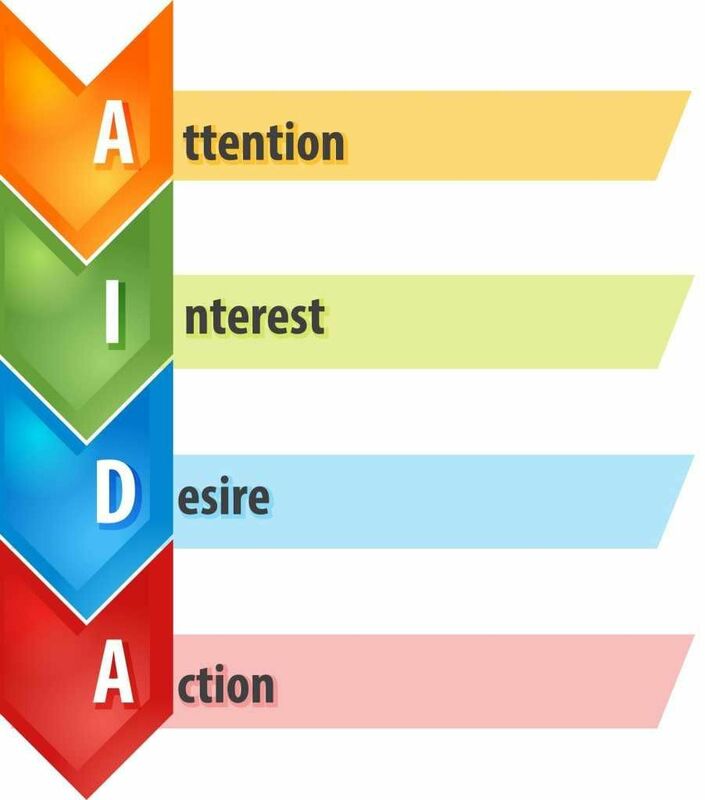 Therefore, the AIDA model says that Awareness leads to Interest, which leads to Desire, and finally, Action. Let us consider ways to use the AIDA model by looking into each part of the hierarchy. Placing advertisements in unexpected situations or locations. This is often referred to as guerrilla marketing. Creating shock in advertisements through provocative imagery. An intensely targeted message. This is also referred to as personalization. Essentially, the goal is to make consumers aware that a product or service exists. Creating interest is generally the hardest part. For example, if the product or service is not inherently interesting, this can be very difficult to achieve. Make sure that advertising information is broken up and easy to read, with interesting subheadings and illustrations. Focus on what is most relevant for your target market in relation to your product or service, and on conveying only the most important message you want to communicate to consumers. A good example of this is Wendy’s “Where’s the beef?” ad campaign that focused on the fact that Wendy’s hamburgers contained more beef than their competitors’ hamburgers. The second and third steps of the AIDA model go together. As you are hopefully building interest in a product or service, it is important that you help customers realize why they “need’ this product or service. Think about how the content in infomercials is presented – they aim to provide interesting information on the product, along with benefits of buying it – benefits that ideally make consumers want the product more and more. Infomercials do this extremely well by showing the product being used in several creative situations. Convey to the audience the value of the product or service, and why they need it in their life. The last step of the AIDA model is getting your consumer to initiate action. The advertisement should end with a call to action – a statement that is designed to get an immediate response from the consumer. For example, Netflix uses persuasive text to convince the consumer to try their free trial. Netflix communicates how convenient their product is and highlights its value, then urges consumers to sign up for a free trial. Good advertising should elicit a sense of urgency that motivates consumers to take action RIGHT NOW. One commonly used method for achieving this goal is making limited time offers (such as :free shipping). CFI is a global provider of financial analyst training and career advancement for financial professionals. To learn more and advance your career, explore the additional relevant resources below.